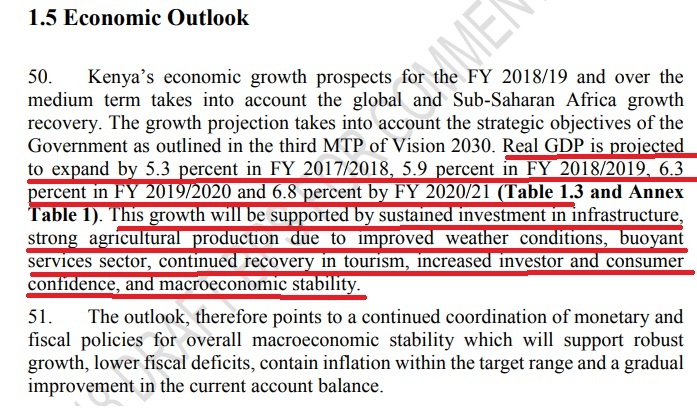 The Big Four Agenda has been featured prominently on the Kenya Budget Policy Statement 2018/2019. This document which is commonly known as BPS was published on National Treasury website on Friday 19 Jan 2018. The Big Four Agenda document containing the assessment of the current state of the economy and financial outflow over the next three years. It also contains information on how Kenyan government will generate revenues for the next financial year and in the medium term. Reading the document, you will understand how much is allocated to each sector including the national assembly and judiciary. These are the ceilings or the maximum amount of resources. This is the time for you to know how much your county will receive as total equitable share. On public debt, you will get fresh information on how much your government is planning to borrow in fiscal year 2018/2019. I know this will elicit debates. 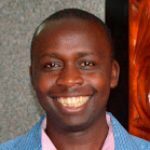 The document available online is a draft and National Treasury will be seeking to receive views from the public as required by the constitution of Kenya. 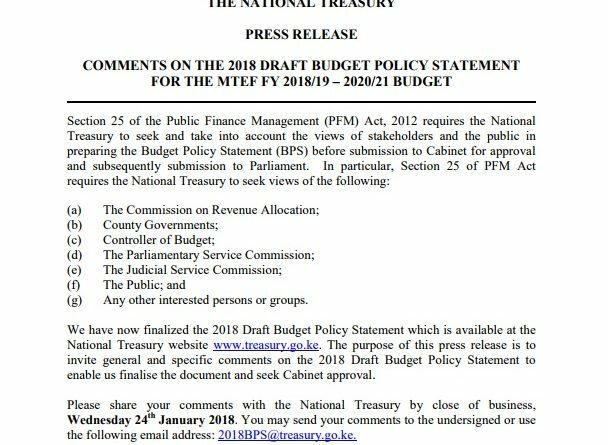 This is happening today, so the national treasury expected that Kenyans have not only read but also understood the 110 page document full of financial and economic jargon. It’s unfair, the notice should have been longer, at least 7 days notice is good. This amble time will enable Kenyans to discuss the proposals presented, identify loop holes and recommended better solutions. On reading the document I noted that after every few pages we are reminded about “The Big Four.” That is the areas where Jubilee government will focus on for the next five years up to 2022. Image 1: The Big Four to be pursued by Jubilee Administration up 2022. Image 2: Economic out look. I look forward for a time when Kenya will stop depending on rain-fed agriculture. That is the time we will be truly be liberated from shackles of poverty and anger. It can be done, Israel has been in that route before.